My going-to-be p4 boy has been “harassing” me for a smartphone of his own – yes, I do know that many of his school friends do own a used /old hand-me-down smart phones but I don’t really see a need for a 9 year old to be having his own phone. However, given that there will be more after-school classes/CCA in the new academic year (ie the school bus would not be able to send him home), I do think it is high time that he learns to take his own public transport home. His sense of direction is also not the best, he has gotten lost in an unfamiliar shopping mall before and had to borrow the phone of a shop to call me when he lost his way. Due to this very reason, I am going against my principle by giving him a device that works like a phone but it is not a phone still! Not a smartphone per say (no games etc) but a smart device for him to contact me vice versa, and also track his where-about via GPS. Of course you need a SIM card to do that, which I will share a zero dollar mobile plan for this watch (I will share more below), perfect for primary school kids whose usage may not be a lot. I received Oaxis my First Fone S2 just in time for trial run before school actually start next week. Though it may look chunky at first glance, it is actually very light and fits my boy’s wrist nicely. It does not look oversize on my 9 year old wrist or even my 7 year old’s wrist. It feels very well-made but I think I can only comment more after weeks or months of usage. As I would like to have this review out before the new academic year , I would just review based on our usage this week. The first order of thing would be a need for a working SIM card. What I was recommended by Oaxis was the Circles.life zero dollar package which includes 30 minutes talk time, 1G data and caller ID per month. So if you do not burst the quota, the plan is virtually free and there is no contract period. The only outlay would be SGD 35 for the cost of the SIM card. Here is the link for this zero dollar SIM card from Circles.life which I think would sufficient for big J’s usage. Alternatively, you can also consider this plan from Singtel, however do note that the Oaxis watchphone whihc is bundle is not the same one as the one review herein. Once the active SIM card is detected, you will have to install my First Fone app on your own smartphone being the admin user (only the admin user can change certain function like class mode, care call which will be elaborated below). It is a pretty straight forward app and easy to navigate too! All other users can also communicate via the same apps just that they are not the admin hence would only be able to do the basic like voice, video call, messaging etc. One of my biggest worries if it can be allowed to be brought to school for use. There isnt a clear directive my kids’ primary school but there is a classroom mode (which is controlled from the app by admin which is me) whereby you can set when this device becomes merely a watch ie no calls or messaging can be made during designated timings and days of the week. During class mode, the only 2 functions that are still working are SOS and GPS tracking. I can also set alert whereby big J’s location is send to me at every 10 minute interval especially the hour he is making his way back home. e) Geo-fencing alert – you can set area whereby it is a safe area from 200m to 2000m from a designated location be it your home, the school or tuition centre, etc – beyond that , an alert will be given. f) SOS button which is activated by holding on to the red button on the watch phone. Once activated, I will receive an emergency location alert with a 30s live recording of surrounding sounds. 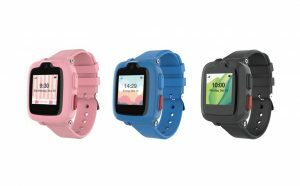 j) Camera – with a 1.3mp camera, this allow the watch to make video call and also for the kid to take random photos. The photo quality is definitely not on par with the current quality of top grade smartphone’s camera but this is quality is good enough for the video call. I like that my First Fone is still a relatively “primitive” device with voice/video call , messaging using voice memo and a camera (compared to the variety of very advanced smartphones). In view of big J’s safety and my peace of mind, I would need to have the ability to contact and track my 9 year old boy when he leaves the school premises. I guess this is the next best thing besides having a smart phone. You may argue that I could also get a simple and cheap phone like the Nokia 3310 however, I prefer my First Fone as it can be worn by my boy all the time. With a smartphone, it is also prone to misplacing etc. I don’t think you can misplaced a watch unless you remove purposely. This version comes in three colours – black, blue and pink and retailing at USD 149/SGD 199. You can purchase the phone online. If you wish to touch and feel the phone before purchasing , you can visit Isetan, Takashimaya, Robinsons, Challenger and Kiddy Palace. 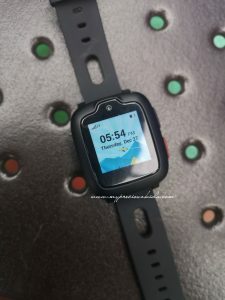 It is also splash proof meaning you can wash your hands not having to worry about the watch as little splashes of water would not spoil it but not bring it swimming though. If there is anything to critic, it would be the battery life. It was noted that the battery life can last 2 days but based on big J’s current usage, we have to charge it daily. 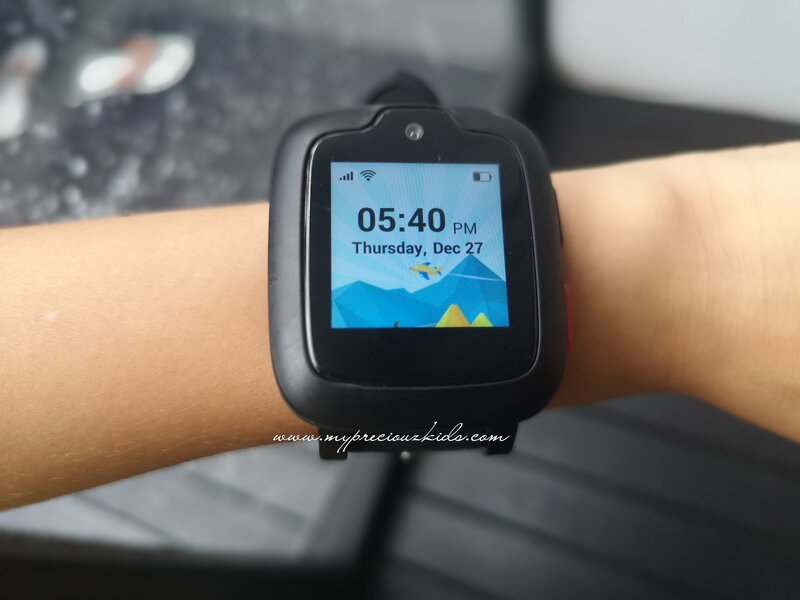 Oaxis also had an earlier model S1 (watchphone) which does not come with a camera hence unable to do video call. 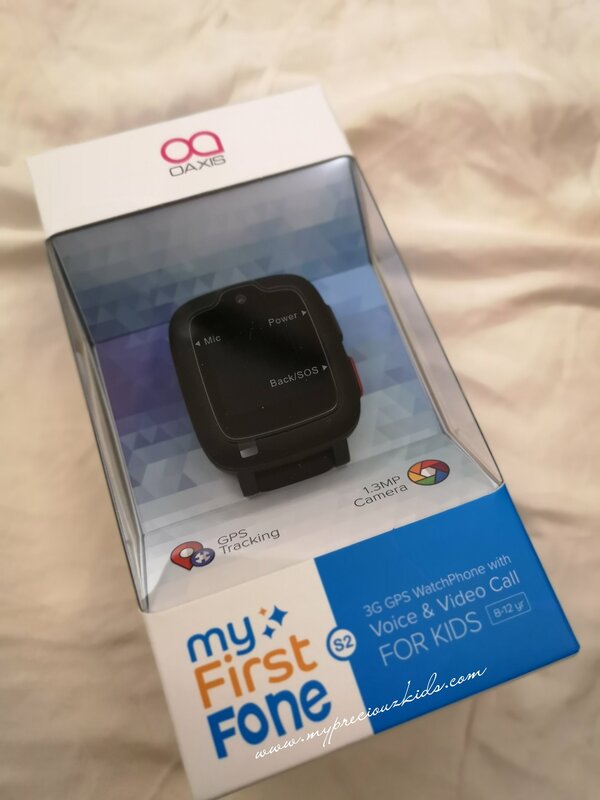 Oaxis has kindly sponsored the same set of my First Fone S2 worth SGD 199 (blue or pink) to one lucky reader so that she/he can track his/her child after school. Giveaway ends 20th Jan 2019 Sunday 2359. The very lucky winner is @spyvonne_chloe. For those you didn’t win, you can still enjoy 15% off using mypreciouzkids via this link. Do note that the prices are in USD and there is a 7% GST upon checkout and remember to input “mypreciouzkids” upon checkout to enjoy 15% off. This entry was posted in giveaway, product.